Robert Herrick. His Covenant ; Or, Protestation to Julia. As if we should for ever part ? I would come back and live with thee ? I'll kiss the threshold of thy door. I'm half return'd before I go. Titian. 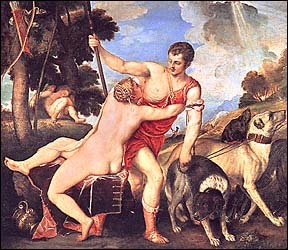 Venus and Adonis 1554. Museo del Prado, Madrid.